H&A Mechanical Services manufacture and supply oil tank protection barriers to help prevent the spread of fire from your oil tank. Contact us on 028 796 27220 for further information on sizes and prices! 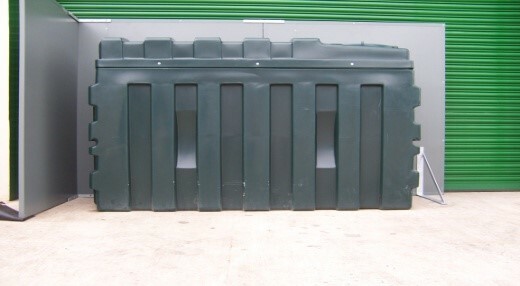 Any eaves less than 1800 mm from the tank should have 30 minutes fire resistance for integrity and insulation extending 300 mm beyond each side of the tank, and either (a) any part of the building wall less than 1800 mm from the tank should be imperforate (1) with a minimum 30 minutes fire resistance in terms of insulation, integrity and stability to internal fire; or (b) provide a fire wall (2) between the tank and any part of the building which is less than 1800 mm from the tank. The fire wall should extend not less than 300 mm higher and 300 mm wider than the tank. Provide a fire wall (2) between the tank and the boundary or a boundary wall, which has a minimum of 30 minutes fire resistance in terms of insulation, integrity and stability to fire on either side. The fire wall or fire resistant boundary wall must extend not less than 300 mm higher and 300 mm beyond the ends of the tank. (1) Excluding small openings such as air bricks, etc. (2) Fire walls should be imperforate non-combustible walls or screens, such as a masonry wall or fire-rated composite panel screens. 3. The terminating point of any flue should be not less than 1800 mm from an oil storage tank unless a fire wall as described in (b) above is provided between the tank and the flue termination. 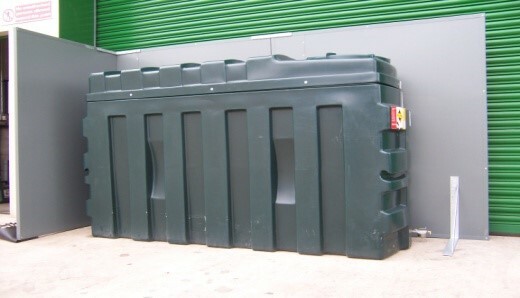 All H&A oil tank protection barriers have been fully tested and comply with BS476 Part 22 for Integrity and Insulation.